Any Spotlight Client in the federation can configure the operations of any Spotlight Diagnostic Server in the federation. Any Spotlight Client in the federation can configure the operations of the federation. Any Spotlight Client in the federation can configure the operations of any Spotlight Diagnostic Server in the federation. 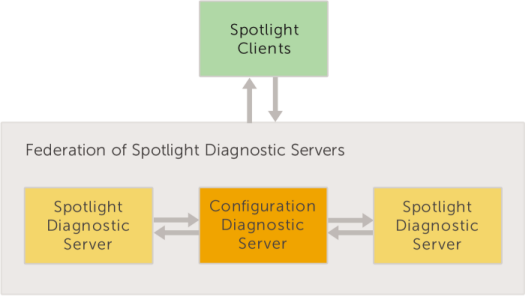 Select the Spotlight Diagnostic Server operation to configure (Auto Update - Use of Extended Events). 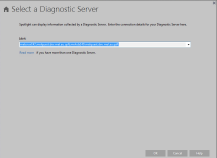 The dialog to configure the selected Spotlight Diagnostic Server operation opens. 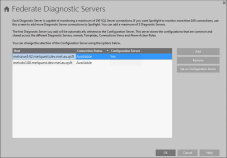 Select the Spotlight Diagnostic Server and set the new configuration. Any Spotlight Client in the federation can configure the operations of the federation. Click Configure | Diagnostic Server | Federate Diagnostic Servers. Add / Remove Spotlight Diagnostic Server from the federation and set the Configuration server. One Spotlight Diagnostic Server in the federation is selected as the Configuration server. Configurations shared between the Spotlight Diagnostic Server in the federation are applied to the Configuration server. Other Spotlight Diagnostic Server in the federation poll the Configuration server for updates. The following configurations are applied directly from the Spotlight Client to the Configuration server. Other Spotlight Diagnostic Server in the federation poll for updates from the Configuration server. Note: If the Configuration server is down then any changes made by a Spotlight Client to any of the above configurations will not be saved. If any other Spotlight Diagnostic Server in the federation is offline then when it is online again it will poll to receive updates from the Configuration server. The Configuration server keeps transactions (recording changes to the above configurations) for 5 days. 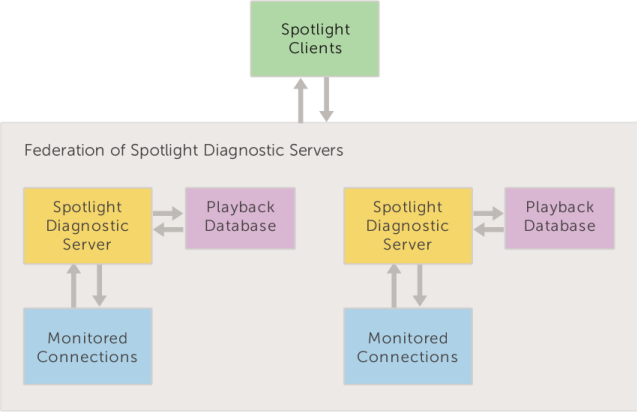 Select the Spotlight Diagnostic Server. Click Set as Configuration server. Spotlight Diagnostic Server authenticate with the Configuration server using Windows authentication over TCP Port 40403. For each Spotlight Diagnostic Server in the federation, the Windows account that the Spotlight Diagnostic Server is running under must be valid in the domain of the Configuration server. Connect a Spotlight Client to a federation by connecting the Spotlight Client to any Spotlight Diagnostic Server in the federation. This is the primary server for the Spotlight Client. 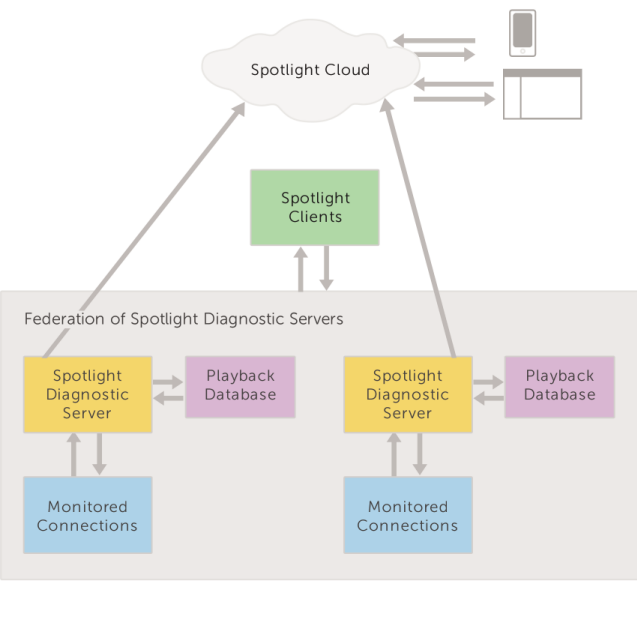 In a federation of Spotlight Diagnostic Servers, each Spotlight Diagnostic Server connects to its own Playback Database.